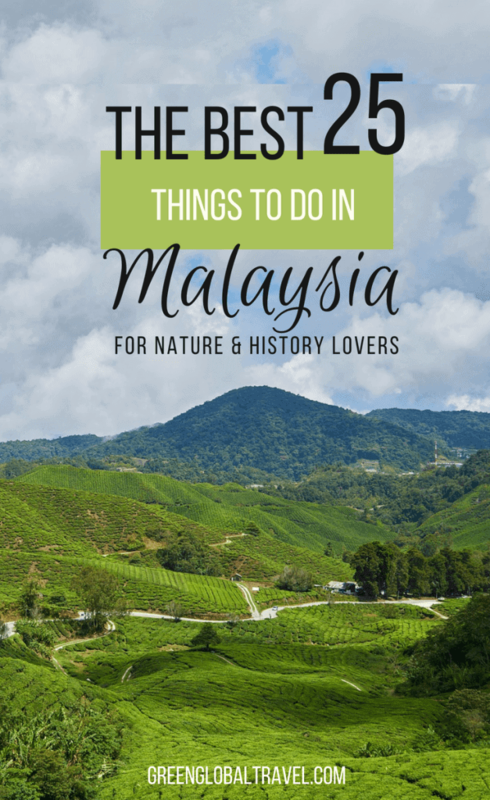 Here are our picks for the 25 top things to do in Malaysia for nature lovers. I can virtually guarantee that these experiences will make you fall in love with this stunning country. Located just outside of Kuala Lumpur, the Batu Caves are one of the major ecotourism attractions in Malaysia. If you love nature, it’s a place you won’t want to miss when traveling around the country. You can get to the area by public transport from Kuala Lumpur, and it’s an easy half-day trip when you’re based in the city. At the entrance, you’ll see the famous golden statue of Lord Murugan next to quite a few souvenir stalls, as well as the hundreds of steps leading up to the caves. Just beware of the monkeys along the way! They’re full of shenanigans, and are know for stealing things when tourists aren’t looking. The caves also serve as Hindu temples, you’ll see people praying and giving offers inside the mountain. When the heat and humidity gets too much, do as Malaysians do and head to Cameron Highlands, a hilly area near Kuala Lumpur. There’s plenty to see and do in Cameron Highlands, including visiting tea and strawberry plantations, where you can enjoy delicious tea and strawberry jam! Cameron Highlands also offers hiking opportunities, with a dozen numbered hill trails offering stunning views. 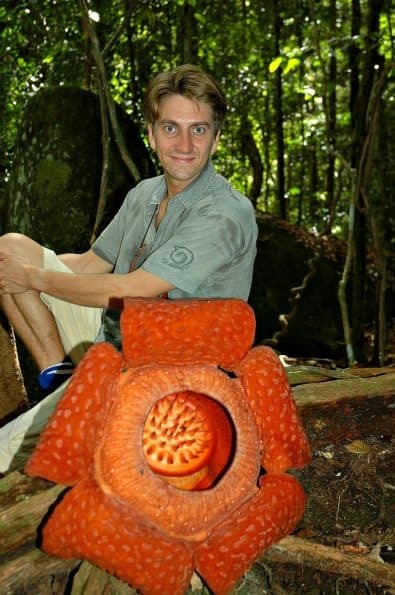 If you’re lucky, you may also be able to see Rafflesia flowers in bloom. These giant, stinky flowers can be found in the area all year-round. Chiling Waterfall is a beautiful waterfall and fish sanctuary located in a tranquil tropical Malaysian forest. Located within a gazetted forest reserve, the waterfall is only open to the public on Fridays, Saturdays, and Sundays. The local authorities did this order to maintain the area’s pristine ecosystem. 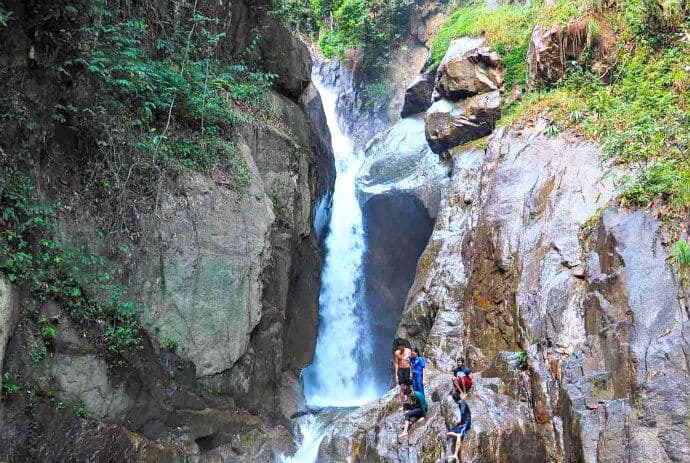 Other than serving as a fish sanctuary, the waterfall is also one of the main water sources for people living in the surrounding Klang Valley. Reaching the waterfall requires a relatively easy hike of about 45 minutes, including six river crossings. Although the deepest water level that you will come across is only up to your knees, crossing is fun because the river is teeming with fish. Chiling Waterfall is easily my favorite hiking spot in Malaysia. Even though it’s not considered one of the best waterfalls in the world, I feel completely connected to nature whenever I’m here. Kuala Lumpur is a busy, crowded, polluted city. It’s definitely worth a visit for the famed Petronas Towers, Batu Caves, and great street food scene. But the constant traffic and concrete of this major metropolis may leave diehard nature lovers yearning to get away from all the chaos and commotion. FRIM (short for Forest Research Institute Malaysia) is a great location for spending a day or more in the great outdoors. Located just 15 miles outside of central Kuala Lampur, it’s a beautiful forest surrounded by trees, birds and silence. There are numerous walking trails there, with information about the rainforest ecosystem, a canopy walk, and an interesting visitor center. For centuries, the East and West have been in contact through trading and colonization. Some of the best historical cities in Malaysia that highlight this era of history are located in the state of Malacca. Known locally as Melaka, the area is affectionately known as the Historic State. Malacca is the center of the Malay culture, and has had an impact on the cultures of both modern Malaysia and Indonesia. Along with Georgetown (which is located in Penang, to the north), the Old City of Malacca has been granted UNESCO protection as the Historic Cities of the Straits of Malacca. 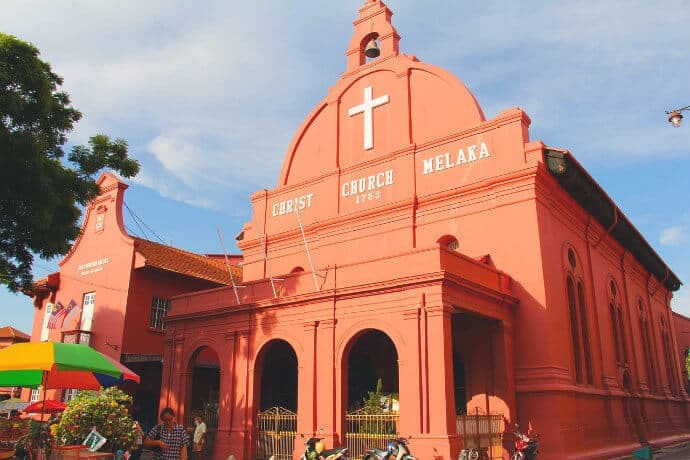 The old town of Malacca is lined with Portuguese and Dutch-style churches, impressive colonial government buildings and squares, along with walls and fortifications. The layers of multicultural heritage found in Malacca is both staggering and exciting. My favorite thing to do there is to visit the tombs of Hang Tuah and Hang Jebat, who were classic heroes from the 15th century Malacca Sultanate. Malaysia’s oldest national park is Taman Negara (which means “national park”), which is located in the center of Peninsular Malaysia. Taman Negara is a wonderful place to explore the rainforest. You can spend the night in a hide in the hope of spotting elusive wildlife species such as Slow Lorises and Leopards. Make sure you hire a guide if you’re planning to sleep out. The trails are overgrown and hard to follow, and you may end up getting lost in Taman Negara, like we did! 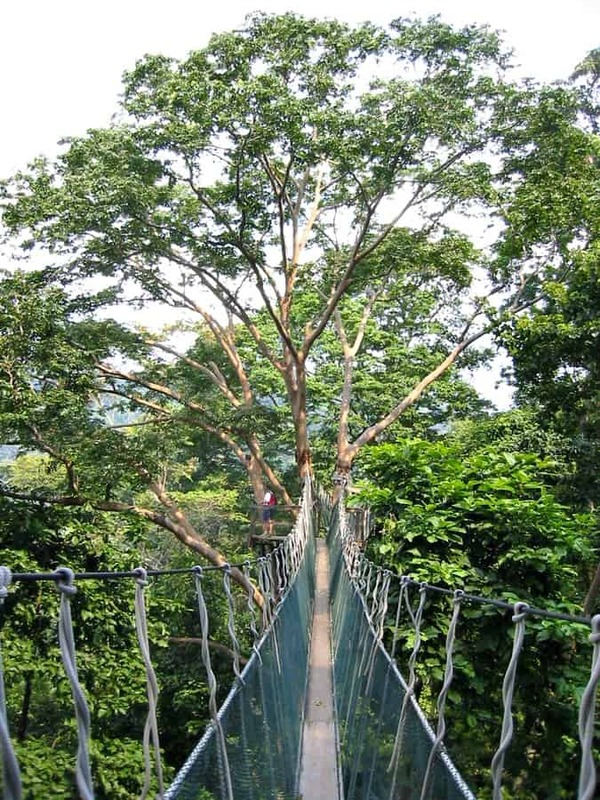 If you’re not into extreme adventures, there’s also a canopy walk and shorter trails available near park headquarters. Situated just 30 minutes by car from the city of Kuching, Bako National Park is Sarawak’s oldest national park. Bako is small, covering just 27 square kilometers. But, despite its small size, the park is home to all kinds of verdant vegetation, including mangrove forests, swamp forests, and delicate cliff vegetation. Bako is so diverse that you can actually find every type of vegetation Borneo has in this one park. It’s also home to a diverse array of wildlife. 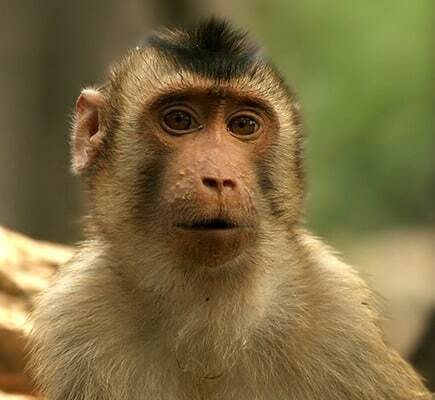 You’ll see plenty of long-tailed macaque monkeys and silver leaf monkeys, both of which are always on the lookout for things that they can steal from you. Another animal you’re likely to see is the wild boar, many of which are so tame that they’ll come right up to you. Like the monkeys, they’re looking for things to steal, so keep your hand on anything valuable or anything they shouldn’t eat. 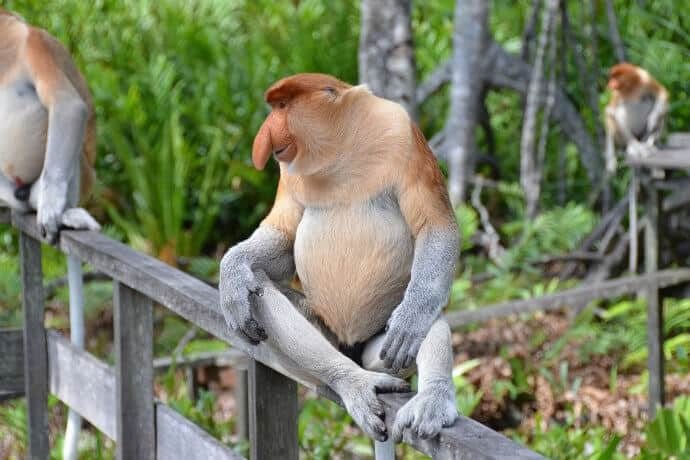 Perhaps the most exciting animal that lives in Bako is the bizarre-looking proboscis monkey. Bako is home to roughly 300 of them, and you’re most likely to spot them at dawn or dusk. During the rest of the day, the park has 16 fantastic walking trails to suit every need and ability. Some take as little as 30 minutes to trek, while others can take an entire day. 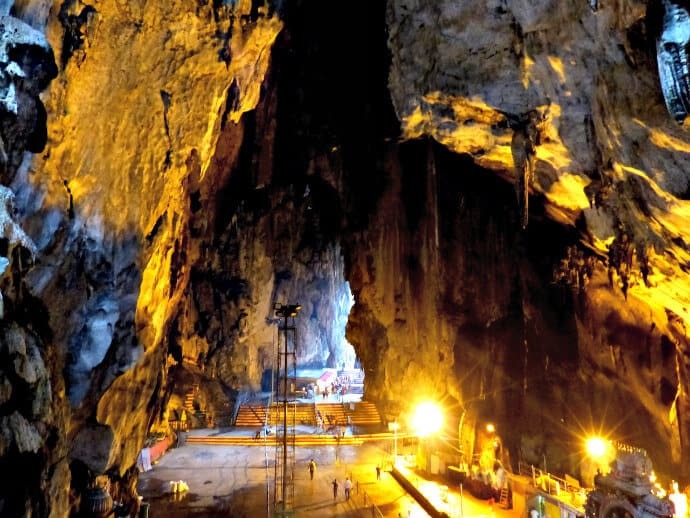 One of our favorite things to do in Malaysia is to visit Gomatong Cave. The cave is located in Sandakan, which makes it a convenient place to explore after a jungle stay along the Kinabatangan River. The prime reason most people travel to this cave is to see the edible bird’s nests, a Chinese delicacy, which are harvested there. It was an interesting place to visit, as not only birds but also bats call the cave home. As a result, there’s a huge pile of guano in the center of the cave which, in turn, attracted other creepy crawlies. I will not go into the details, but let’s just say we witnessed an ecosystem there the likes of which we had never seen before. 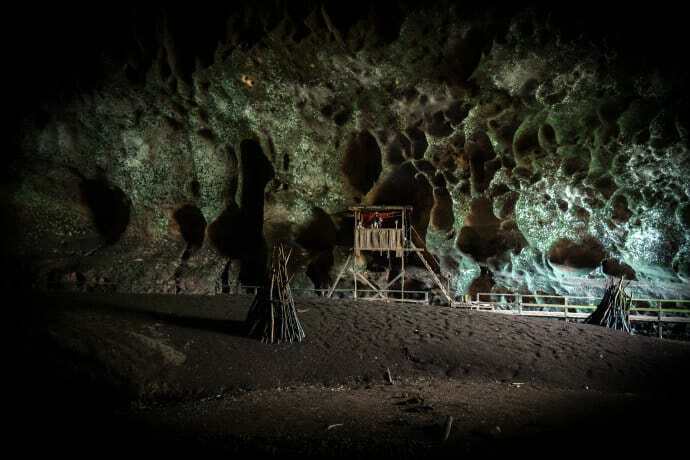 The Gomatong Cave is situated in a protected wildlife area. So, as you make your way along the path towards the cave, you should definitely keep your eyes open for orangutans. Mount Kinabalu rears 4,095 meters (13,435 ft) above the lush forests of Borneo, an enormous granite monolith that has become a magnet for adventurous visitors to Malaysia. Tens of thousands of people climb the mountain each year. 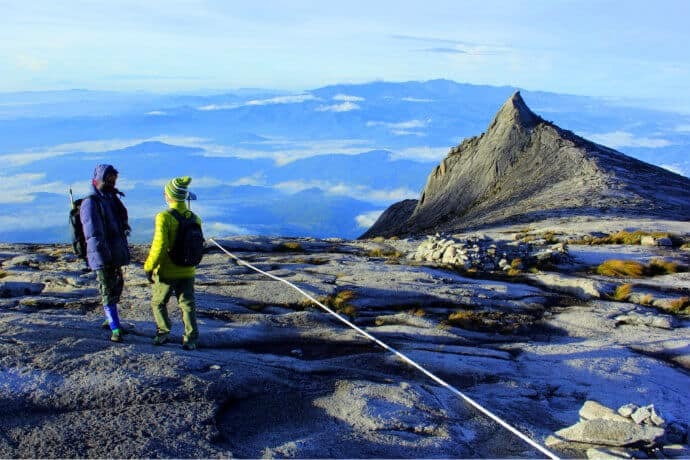 But fortunately the UNESCO-protected Kinabalu National Park carefully controls the tourist footprint, issuing a limited number of permits and requiring all trekkers to hire a local guide. The first day’s hiking follows a clear path through richly-canopied forest, where mosses and bright tropical flowers are picked out by shafts of sunlight. Climbing through the various vegetation zones of the mountain is fascinating. You’ll go from lowland rainforest, through cloud forest, and on to sub-alpine meadows before reaching the granite fields of the summit plateau. Getting up at 2 AM and summoning every iota of determination to make the final trek at altitude is tough. But breathtaking views from the top at dawn are worth every gasping breath. One of my most memorable experiences from my time in Malaysia was a rainy half-day cruise I took down the Kinabatangan River. Now, many people go on three-day small ship cruises on the mighty body of water and never see any endangered animals (which include orangutans, proboscis monkeys, pygmy elephants, and more). It can even be difficult to see some of the animals that live in abundance here, such as hornbills and crocodiles. However, even without any wildlife sightings, an afternoon on the river is an enchanting experience. The day of my trip it was raining so hard that we couldn’t even see out from our bungalow. We napped until the storm passed, and at dusk we headed out on the river without any high hopes of coming across any majestic creatures. However, luck was on our side, and the rainy afternoon called all sorts of animals to come out and enjoy the crisp evening weather. 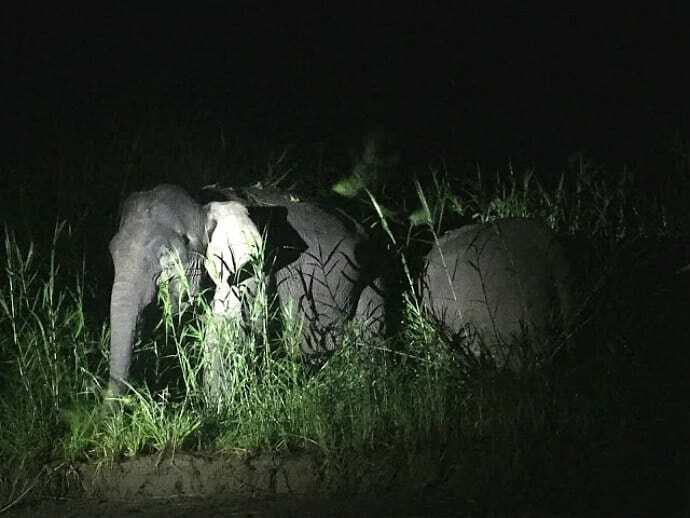 We even came across a family of five pygmy elephants, which is a memory I’ll cherish forever. If you do go on a wildlife-watching cruise on the Kinabatangan River, it’s crucial to do so in a responsible way. One of the best things to do if you’re in Kota Kinabalu is to go snorkeling in Tunku Abdul Rahman Marine Park. This underwater park is full of amazing wildlife, but my favorite moment of our day trip was swimming next to a wild hawksbill sea turtle. Even if you’re not a diver, some of the reefs are shallow, which allows you to see parrot fish, clown fish, and even lionfish up close. It was incredible to see the marine ecosystem at work, especially in terms of seeing “Nemo” hiding amongst the anemone. Just be warned: There are barracudas here. 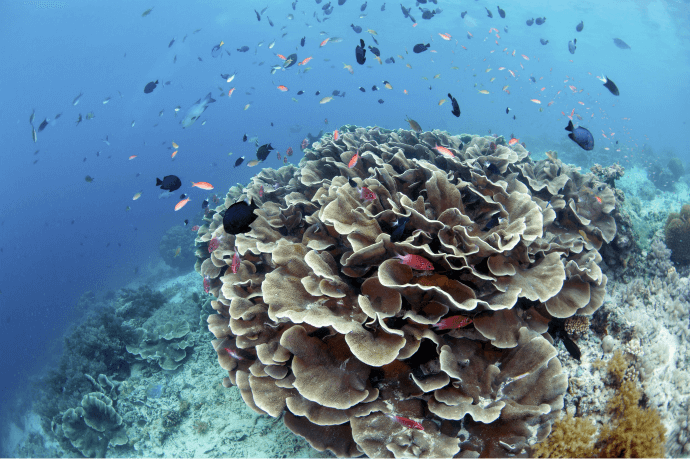 However, your knowledgeable guide will tell you how to stay safe while exploring in this easily accessible reef. Our tour had all the snorkeling gear and lunch included, but I strongly recommend that any snorkelers wear sunscreen to avoid a nasty sunburn on your back. Borneo is one of the wildest parts of Southeast Asia. 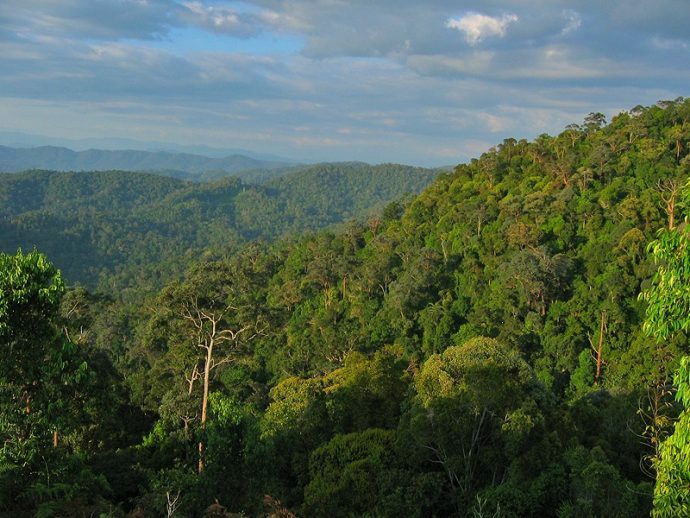 Indeed, much of this Malaysian territory’s jungle canopy is far from the tourist trail. Yet it remains easily accessible, with great opportunities for guided rainforest kayaking. When we went near Kuching, a slow drizzle tickled my neck as we pushed through the tropical air and down the gentle river. The soft buzz of water hitting leaves added another sonic layer to the sounds of our paddles and the life in the jungle on either side. As the sun emerged, our local guides taught us all about the flora and fauna we were floating past. Then they fed us an indigenous lunch of bamboo chicken and local greens. Gunung Mulu National Park is renowned for its immense biodiversity, the distinctive tropical karst terrain, and its vast cave network. Located deep in the Borneo jungle, Mulu is recognized as one of Malaysia’s two natural UNESCO World Heritage Sites. Criteria for this designation include Mulu being the most studied tropical karst area in the world. It has at least 295 kilometers of explored caves, including the largest known cave chamber in the world, Sarawak Chamber. We ventured to this famous chamber, which is not an easy task. 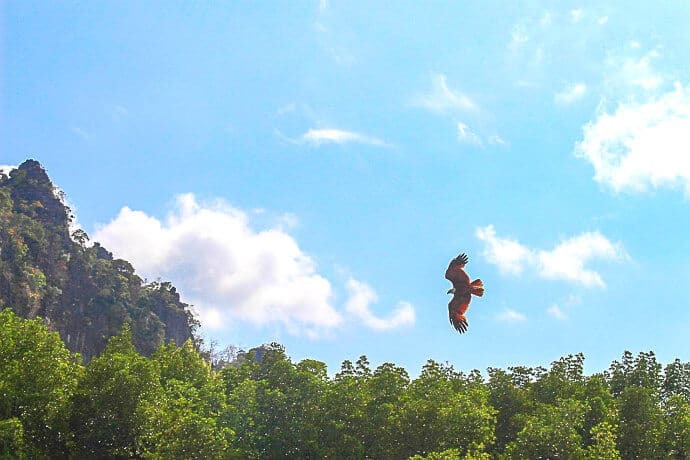 First, it takes a flight to reach Mulu’s isolated location. Then you must prove your spelunking skills to national park guides, who deem if you’re fit enough to attempt a trip into the Sarawak Chamber. Each month, only a few two-day excursions to this cave are scheduled. It takes a 16-hour round-trip trek through the dense jungle. Finally, it’s a wet entry, swimming into the cave, where a huge racer snake greeted us in the dark water. Unfortunately, we were unable to penetrate the expansive space of Sarawak Chamber because the cave was too flooded from recent rains. Yet just the attempt to get into the cave chamber was such an incredible and worthwhile adventure in and of itself. Thankfully, Mulu National Park offers other cave superlatives, many of which are more easily accessible. For example, it only took a short stroll through the beautiful rainforest-covered mountains in order visit Deer Cave. This is the largest known single passage cave in the world and contains the most species of bats found in a single cave. 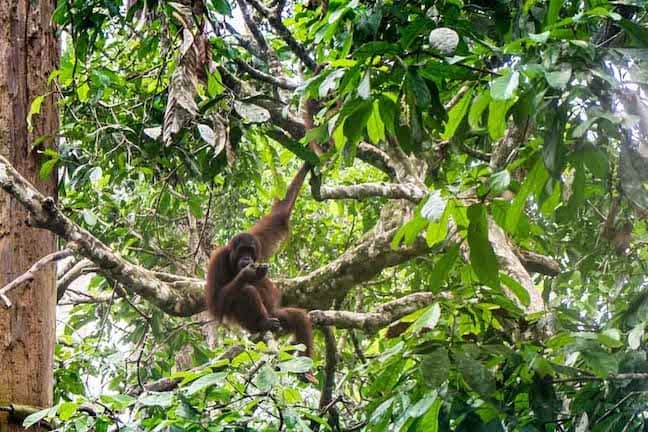 Along with Sumatra, the island of Borneo is the last one where wild Orangutans can be found. But unfortunately rampant deforestation to clear land for the palm oil industry has reduced Borneo’s orangutan population to a fraction of what it once was. One of the best places to see wild Orangutans is Sabah, the northern Malaysian state in Borneo. 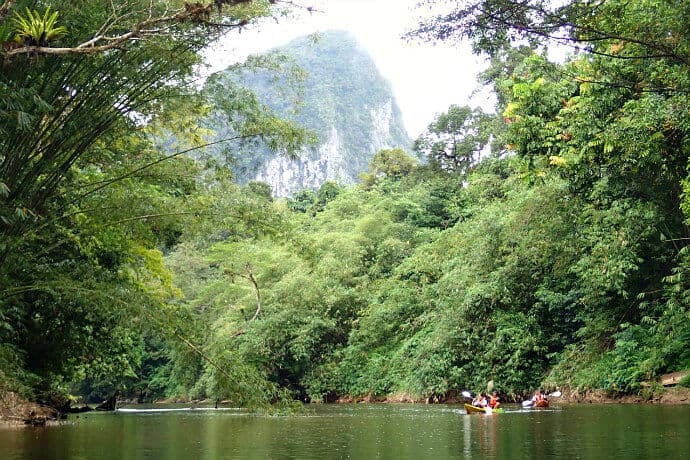 The most accessible location is the Kinabatangan river, which is located near from the city of Sandakan. 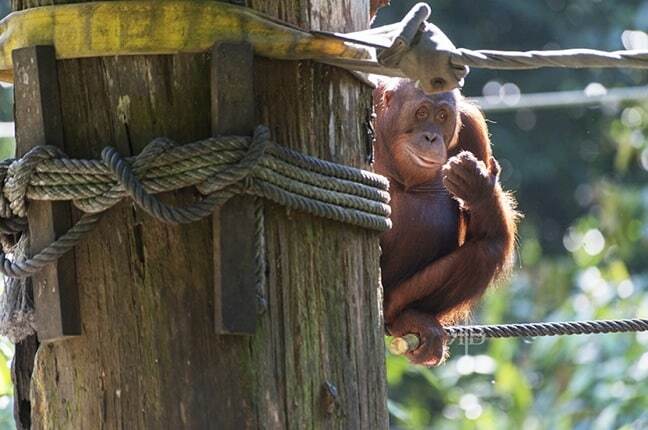 If you’re really pressed for time, the easiest way to meet Malaysia’s beloved “men of the forest” is by heading to a rescue center at feeding time. This when the Orangutans leave their forest hideouts and head to raised platforms. There, the rangers feed them fruit to the excited oooohs and aaaahs of onlookers. The best Orangutan rescue centers to visit are Sepilok in Sabah and Semenggoh in Sarawak, which is near the state capital of Kuching. The island of Penang is known for its excellent food and colorful cultural festivals. But it’s not generally considered a nature destination. Surprisingly, there are several locations not far from the capital of Georgetown where you can enjoy nature and outdoor activities. For instance, you can ride a mountain bike up to the Air Itam dam, or go parasailing on Batu Ferringhi beach. But our favorite nature activity in Penang was climbing Penang Hill, which is easily accessible from Georgetown. The climb is honestly quite difficult in the heat. But it offers a stunning view from the summit, and the opportunity for excellent wildlife encounters along the way. We spotted a Cobra and lots of Macaques! Penang National Park in Malaysia is considered the world’s smallest national park. But don’t judge it for its size, as it’s packed with tropical plants, animals, and geological features. This park was one of our favorite highlights of our long trip to Malaysia. We felt like intrepid explorers in the tropical forest, with the added bonus of having plenty of opportunities to go Scuba diving and sunbathe. 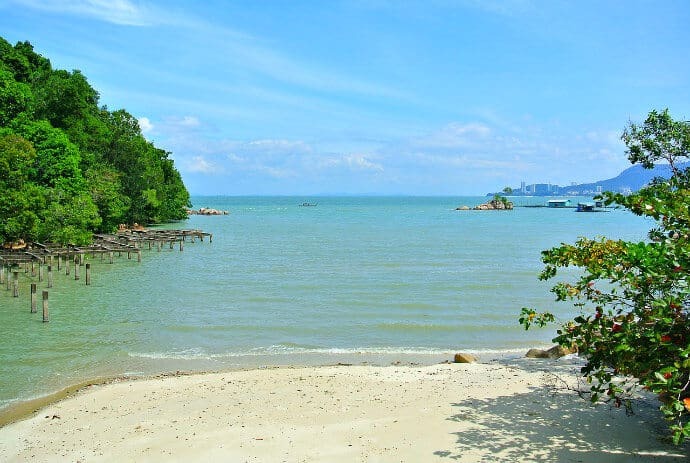 Penang National Park has two main hiking trails: One trail goes through the jungle to Turtle Beach, while the other goes along the coast to Monkey Beach. The first trail is 3.4 km, and it will lead you to a beach with a sea turtle nesting reserve. To protect the turtles, you shouldn’t swim here, but the turtle center has some information and a few ambassador turtles to show you. The other trail is about 3.3 km, and will lead you to the Monkey Beach, where you can swim and relax. On the way there you’ll almost certainly see plenty of monkeys and even monitor lizards. Malaysia’s superb food scene is world famous for its unique blend of spices and chilis. But most visitors have never seen any of these up close, growing in the natural environment. 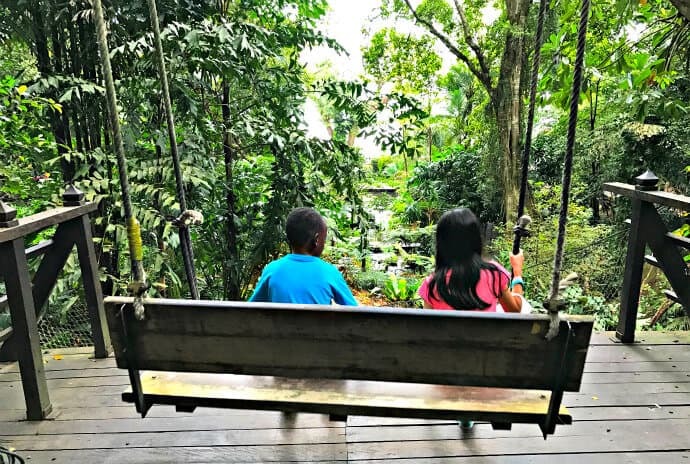 On a recent trip to Penang, Malaysia with our kids, we spent a half-day exploring the Tropical Spice Garden, which is located about 30 minutes outside of Georgetown. This lush and large spice garden is just a short ride from the popular beach resorts, but has the feel of a remote forest jungle. It’s a perfect activity for the whole family! Informative signs direct you to multiple walking paths spanning more than six acres of densely planted gardens, with over 500 spice specimens to learn about along the way. Malaysia’s “four siblings” spices– cinnamon, star anise, cardamom, and cloves– can all be seen growing in their natural environment. There are a lot of gorgeous places to visit in Malaysia, but one that really stuck with me was Tunku Abdul Rehman Park. The park is located off the coast of Borneo, and encompasses five different islands– Gaya, Sapi, Manukan, Mamutik, and Sulug. What makes this park so interesting is that it has beautiful waters so crystal clear, it draws tourists from all over the world. So two of the things that I loved doing the most in Tunku Abdul Rahman Park were snorkeling and Scuba diving. The number of different species of clams and tropical fish that we saw present in the park was amazing. If you get a chance to visit Gaya island, check out the amazing work that MERC (the Marine Ecology Research Centre) is doing to help restore the coral reef system there. There are a number of day trips that head out to the different parts of Tunku Abdul Rehman Park. But, to be honest, you could easily spend as many as five days there, discovering a different island each day. Langkawi is a Malaysian archipelago packed with history and outstanding natural beauty, making it a must-see for adventurous travelers. 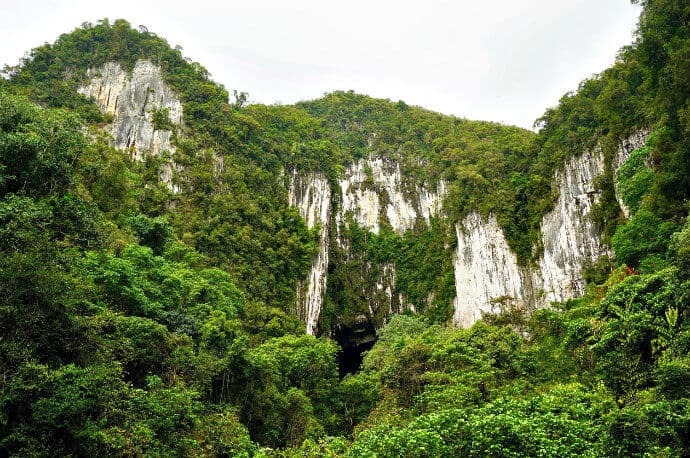 One of the top places to visit in Langkawi is the Kilim Karst Geoforest Park, which is part of a complex of 99 islands that are collectively listed as a UNESCO Global Geopark. The Kilim Karst Geoforest Park is formed by seven protected forests filled with caves, mangroves, and a diverse array of wildlife. The dynamic limestone landscape here dates back 350 to 490 million years, and it’s fascinating to see these impressive rock formations up close. The park tours are guided and include a boat ride through the mangrove forest, with stops to visit caves and admire the stalactites that have been formed over millions of years. If you like bats (which is not my case), you can also see and learn about the three different species of insect-eating bats that are native to the region. The Perhentian Islands (Perhentian Kecil and Perhentian Besar) are two small islands located off the east coast of Malaysia. In addition to being home to some of the best beaches in Malaysia, these islands are also a paradise for those who love underwater activities. 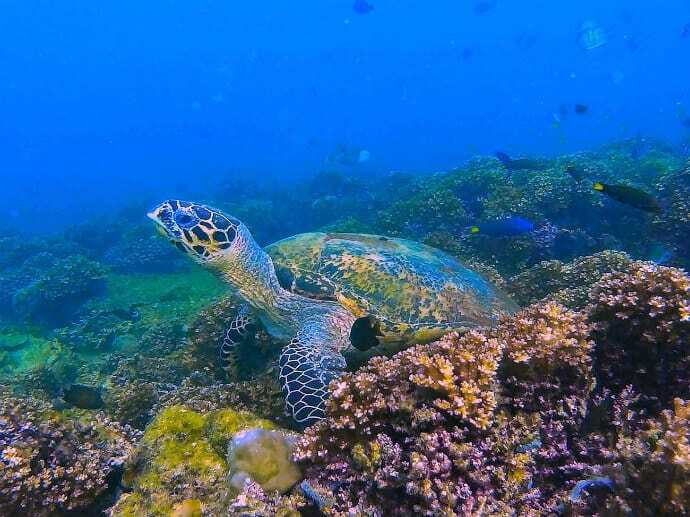 This area is a mecca for avid snorkelers and Scuba divers, since the islands are home to different kinds of sharks and sea turtles, and the possibility of spotting these marine animals is very high. 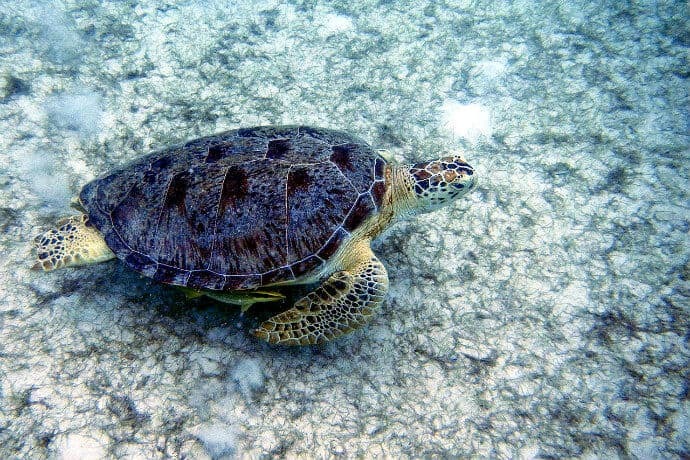 Various operators organize snorkeling tours from both main beach areas (Coral Bay and Long Beach). But we often found great snorkeling spots just off the beach. Note that both islands are part of a protected marine park, and you will have to pay a nominal conservation fee on arrival. We quite enjoyed the local vibe of the islands, where there are no international hotel chains around. Perhentian is easily accessible by boat from Kuala Besut on the mainland. Malaysia has many excellent Scuba diving sites, many of which rival those of nearby hotspots such as Indonesia and the Philippines. 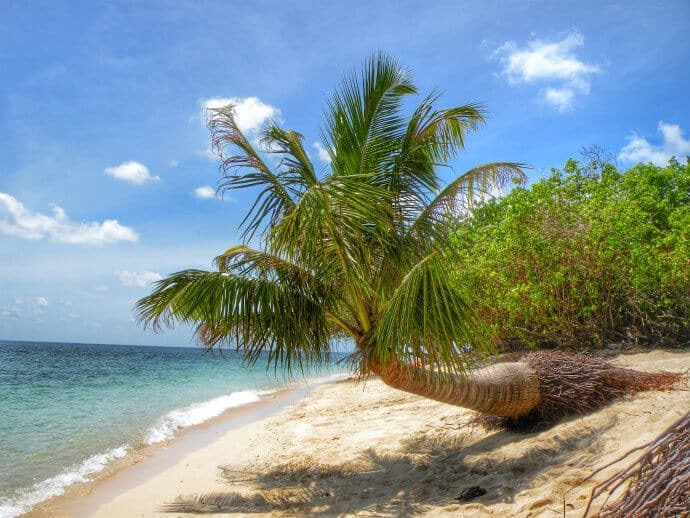 Arguably the best of the bunch is Pulau Sipadan, a tiny island off the coast of Sabah that’s easily accessible from the larger island of Semporna. Pulau Sipadan is famous for its steep walls and rich coral life, where sightings of Sea Turtles and Reef Sharks are almost guaranteed. Be forewarned: The number of daily diving permits in this area is strictly limited. So you’ll need to plan ahead and make reservations with a responsible Scuba diving operator in advance. 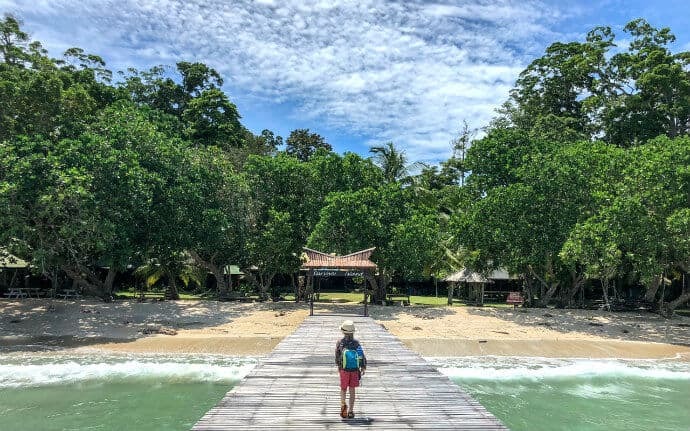 Tioman is a tropical island just off the southeast coast of peninsular Malaysia, and it’s one of the most beautiful and laid-back places I’ve ever visited. The island is not very big, around 20 km long and 10 km wide, but it’s a wonderful place both above the water as well as below. Much of Tioman Island is part of the Pulau Tioman Wildlife Reserve, so you can find many different kinds of monkeys there. Don’t be surprised if you spot a big lizard lurking in the river! The ocean surrounding the island is a marine reserve, with beautiful coral and lots of dive sites where you can spot moray eels, sting rays, and sea turtles. 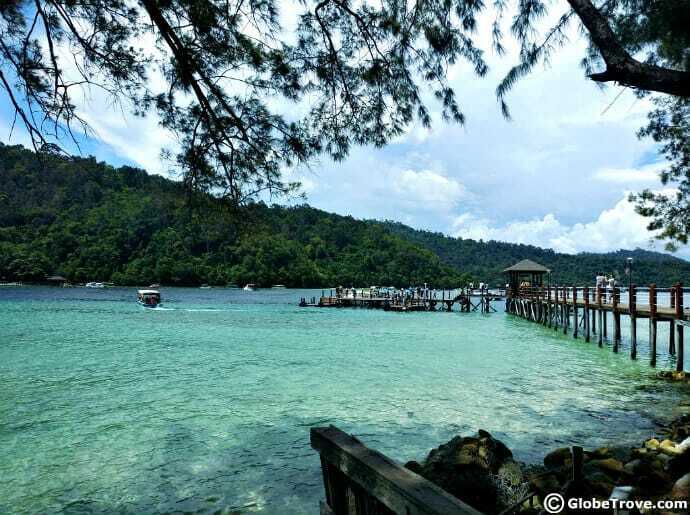 You can reach Tioman island via a daily jetty from Mersing, which costs 35RM each way. Departure times are dependent on the tide, and therefore vary slightly each day. There are several small villages on the island where you can find basic accommodation and a couple of restaurants. It’s not fancy: The simple bamboo bungalows usually have just a bed, fan, cold-water shower, and not much else. Off the coast of Malaysian Borneo in the Sulu Sea sits a small island participating in a big conservation effort. It’s home to one of the world’s oldest sea turtle hatcheries, and a small group of rangers and researchers live there in order to oversee the process. Endangered green and hawksbill turtles have routinely come to this island to lay eggs, so the program monitors the turtles and transplants the eggs to the hatchery for protection. What do they need protection from, you may ask? Poachers, monitor lizards, birds. and poor weather conditions can all threaten the baby turtles’ survival. Their chances of reaching the ocean increase substantially if they can self-incubate at the hatchery and then be released into the wild. 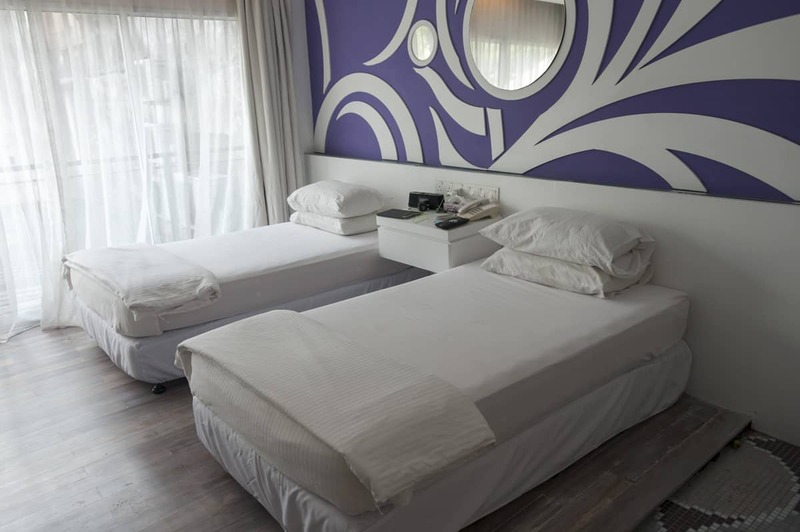 There are a limited number of guests allowed for overnight stays on the island, and there are many rules to follow in order to ensure the safety of the turtles. Located just 10 kilometers off the island of Borneo, you’ll find a secluded, almost untouched island whose biggest claim to fame is being the first-ever location for the hit reality TV show, Survivor. If you’ve never seen the show, just imagine white sand beaches, vivid turquoise waters, and lush forests where the only inhabitants are wild animals. With only two resorts on Pulau Tiga and no permanent residents on the island, you can come close to experiencing what it would have been like to be one of the show’s very first contestants. Arrival to the island is by speed boat from Kuala Penyu, which is approximately two hours from Kota Kinabalu. Once you’re on the island, there are several beautiful beaches and hiking trails to explore. One of the big draws to the island these days is the opportunity to soak in a mud volcano. This bubbling mud pit is said to have therapeutic properties, but mostly it’s just downright fun to roll around in the mud like a buffalo! While on the island, you can also enjoy swinging on the beach, jungle hiking, snorkeling, and spotting the island’s wild animals. 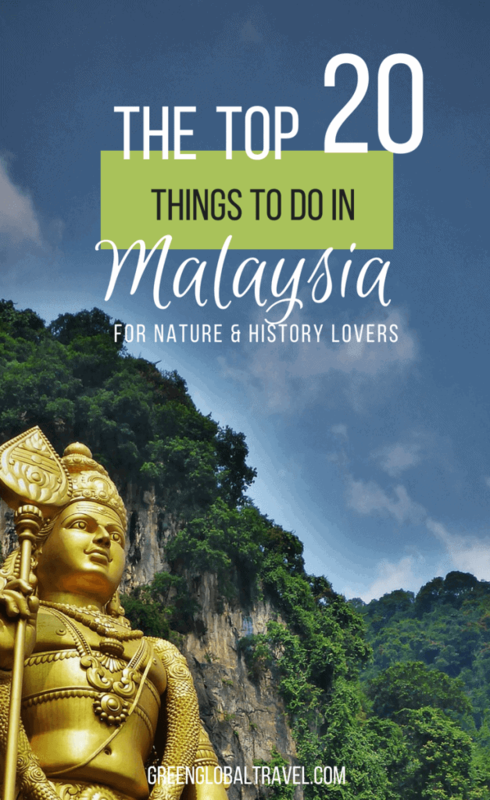 There are many other adventurous things to do in Malaysia for nature lovers. There are also a lot of great hotels and eco lodges in the country. We started out at Sukau Rainforest Lodge, an award-winning eco-lodge in the Sabah rainforest. There we saw pygmy elephants, wild orangutans and proboscis monkeys. Sukau is committed to sustainability, with hot water supplied by solar heaters, lamps using cooking oil, and electric boats used for river cruises to minimize wildlife disturbance.